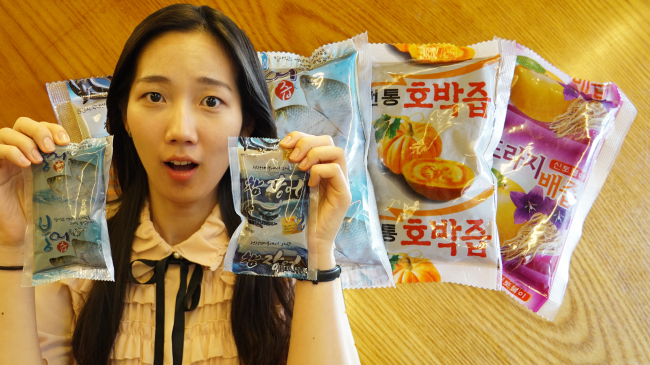 Plastic pouches of murky brown liquid substances may be healthier than one might expect, as they contain “jeup,” or extracts, of various produce considered beneficial in Korea. Talk about sucking the juice out of life. The extracts may not seem very appetizing, akin to oriental herbal medicine drinks. In fact, the taste may actually be worse -- more than just bitter. All kinds of ingredients can be used to make nutritional extracts, from pumpkin and onion to eels and chicken feet. It is about extracting the goodness from the ingredients and concentrating it into liquid form. The juices are made from blending, boiling, squeezing, or some combination thereof. Though the extracts’ overall appearances are similar -- a hazy brown with tiny floating particles -- the tastes differ greatly depending on the ingredients. Smells are distinctive as well. In the chicken foot extract, one can really feel the unctuous taste of chicken cartilage. The aftertaste is very strong as the oiliness lingers in the mouth. Containing much collagen, it is intended for those with weak joints, and is known to be beneficial for the skin. Eel extract is preferred among men for stamina. Eels are thought to be strong creatures, and some believe that energy can be absorbed via their consumption. The extract has a strong fishy smell. There’s no mistaking its eel origin. Adding to the rather weird list of ingredients, carp extract is famous for its nutritional value. The fishy taste is not too strong, contrary to one’s expectation. Pumpkin extract is known for its effect on relieving swelling. Many plastic surgeons recommend the extract to patients after procedures to help with swelling. But the extract tastes nothing like pumpkin, instead imbued with a strong, sour taste. Nutritional extracts can be purchased at local stores, or “health care centers,” though many people have the extracts delivered to their home on a monthly basis and drink a packet every day, hoping for the elixirs to do their work.